With a maximum capacity of 780 people, Lion’s Club Park Family Aquatic Center offers over 13,000 sq. ft. of water area including a multi-use recreation pool, a deep water plunge activity pool, and a six lane 25-yard competition pool with one-meter diving. For a public water recreation park, there are few facilities in Central Texas that can compare in both size and amenities, and residents are looking forward to spending their summers at a waterpark closer to home. The aquatic center includes a 2,200 sq. ft. bathhouse, shade pavilions in several locations, and a sprayground area adjacent to the recreation pool zero-depth entry. The recreation pool also provides a large interactive play structure with tipping bucket, floatables, spray cannons, a themed tot-slide, wet deck, water basketball area, and two flume waterslides – one enclosed and one open flume. These two slides share their 28 ft tall slide tower with the enclosed flume plunge slide, which offers a more intense waterslide experience that plunges riders into deeper water. The deep water plunge pool also boasts a rock climbing wall at the pool edge and a 35 ft tall bowl slide to keep the more adventurous aquatic center patrons entertained. Complementing the recreational water areas at this facility is a separate six lane 25-yard competition pool with deck level gutter and 1-meter diving. 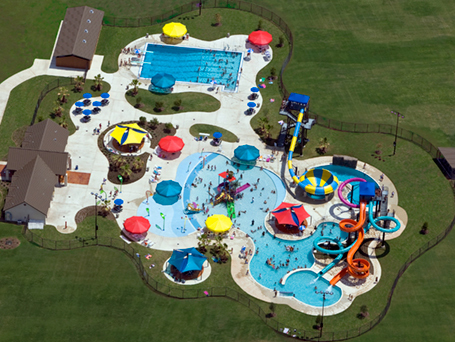 The unique layout and multitude of exciting features make the Lion’s Club Park Family Aquatic Center a place that can truly offer enjoyment for the entire family, as confirmed by overwhelming attendance in its first season of operation. In 2018, Counsilman-Hunsaker conducted a swimming pool audit to identify items that are substandard in pools, items not current with industry swimming pool design standards, equipment not operating as designed, and to assist in defining a course of action regarding the future of their four facilities. The aquatics center has seen significant usage in the last 10 years. Due to this usage, multiple items were noted that needed repairs or replacement, updating, or renovation to keep the facilities operating at a sustainable level, with the ultimate intention of helping the city plan for repairs or replacement.